The weekend before last I ran over to an estate sale not far from us and scored big. For $100 I picked up a wooden sofa, matching chair and coffee table, a rocking chair and these two end tables. 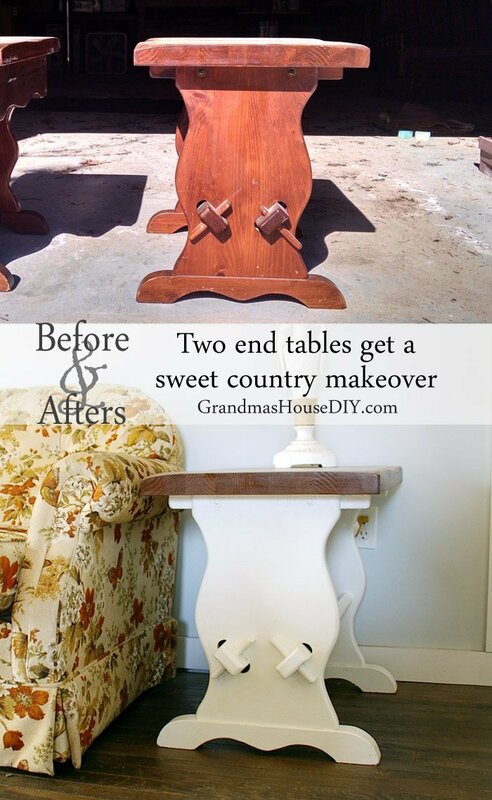 I am planning on refinishing the rocking chair (see it here!) and selling it on craig’s list to try to recoup some of that $100 I spent. But the sofa, matching chair and coffee table I have big plans for on my deck (see them here!). 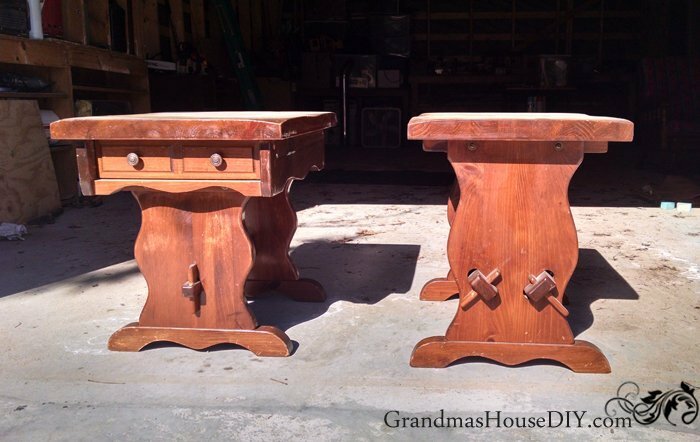 Meanwhile, I went to work on these two old end tables almost immediately thinking that I could really use them in my living room. On top of that, I’ve just been chomping at the bit to try the refinished top and painted base that I’ve been seeing online so much lately that I just love. They were pretty beat up, the previous owners owned cats and the resulting scratches everywhere throughout all of the furniture was pretty impressive. I got out my electric sander and started in on the top and could not believe how easily they sanded down and just how pretty the wood was! I had a moments hesitation when the wood lover in me thought that I should just keep on sanding and refinish the whole pieces but in my house, everything is already wood! I have dark wood floors and I didn’t want these little end tables to become totally lost – so, I grabbed my paint brush and some flat white paint. It took three coats of paint and I probably should have done four but I was so sick of lying on concrete at that point and, honestly, you can’t tell the difference. I also grabbed a satin poly acrylic and ended up doing three coats of sealant over the entirety of each table. Paying special attention to the tops, I didn’t want to be worried about putting a glass down on them because that’s what they’re there for! The tops turned out just SO pretty! And they were unique as well, I’ve never seen tables with such “slanted down” corners before, makes me wonder whether they were made that way or if they had been refinished before and someone else got very carried away with a sander. Of the two end tables only one had a drawer so I removed the hardware and soaked it in vinegar for awhile then scrubbed it up with steel wool. Amazing what just a little elbow grease will do! Because I was using a kitchen table and a plant stand for “end tables” before – these end tables really opened up my living room – I can’t believe how big it looks and feels now! I will have to post a before and after of the whole living room but it desperately needs a rug and I still need to hide the television cables in the wall so I keep on hesitating. I’m sure every blogger does it, “I can’t post that online yet, its not done!” Yeah, well, truth is, is any room ever really done!? I’m very happy with how these sweet little end tables came out. Honestly, this was the first time I’ve painted over solid wood but the fact that they were not family heirlooms made it considerably easier. I think they came out nice and I will definitely be experimenting with wood and paint combinations again in the future. Very nice. You did a great job. 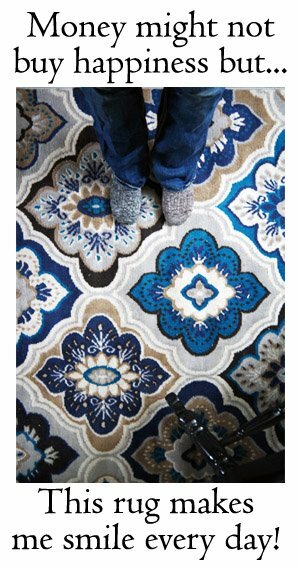 Don’t worry about the rug or wires, we want to see the whole room! lol Thank you! You’re right, I need to post the whole room! Beautiful! You have such great vision. Cool. All changed only for better. Thank you so much! For sure on the less sanding, lol it was night to paint something for hours as opposed to sanding for many more hours! 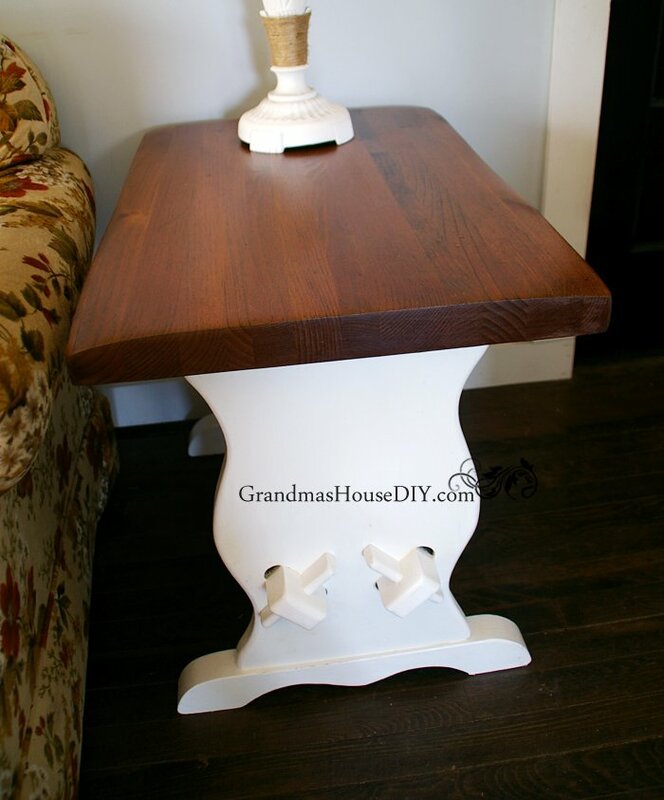 Angie, this was the first time I tried the look of the stain and paint combo and I absolutely love it now! I’m going to have to do it on something else soon! I like the white with the natural top. Thanks for sharing on the Pleasures of the NW’s DIY party! Oh wow, the side tables are stunning Tarah. The stain and paint combination is so cool, it almost looks like they’re floating. So light and airy. I love it!!! Thank you so much Michelle! I had been hankering to try the white paint and stain combination for awhile, I’m glad it turned out on these! These turned out SO good!! I am ready to do my first dining room table with a sanded top and painted base. I hope mine turns out as well as yours! Thank you Melony! I wanted to try the paint and stain combo for a long time when I got these, I’ll definitely do it again! I LOVE white paint and dark wood! Your pieces are very unique and what you did with ’em is beautiful! Leaving the tops wood and painting the bases white was perfect! The tables look great and I am sure you enjoy seeing them everyday! Thanks for sharing at Celebrate Your Story! Chloe thank you so much! I think they turned out adorable! And what a great deal you got! Stopping by from Saturday Shuffle blog hop. Hope you have a great weekend! Those tables look so good! I love the soft edges, too. I’ve been planning to refinish our cheap living room furniture, and now you’ve got me chomping at the bit to get started! Thanks so much for sharing at the #happynowlinkup! Leslie, thank you! 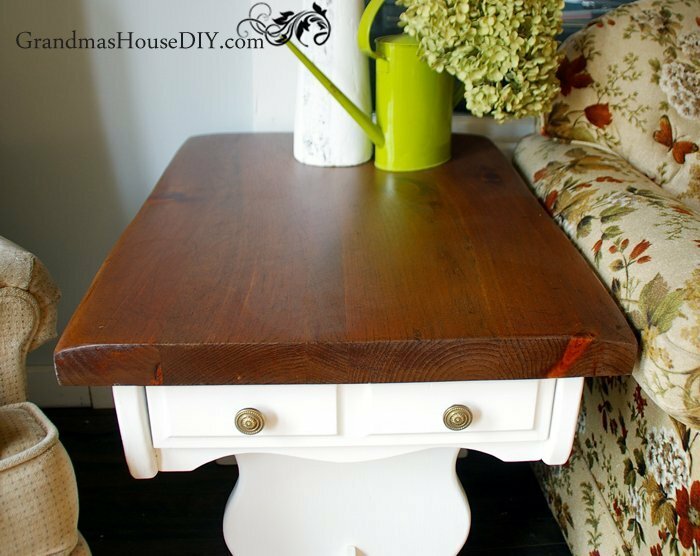 I am in love with the painted and stain look together! Thank you so much Carla, that paint and stain combo is officially my favorite, I’m definitely going to have to do it again! The end tables look wonderful! You did such a fabulous job with the makeover. Thanks for sharing at Snickerdoodle! Love the update – pinned and shared. I totally love this look! I’ve added wood to the top of my faux wood end tables just so I could create the same look: stained top and painted bottom. Gorgeous job!! Oh my goodness, Tarah, what fabulous tables! Beautiful makeover too. Now those amazing keyed mortise and tenon joints on these trestle tables pop. 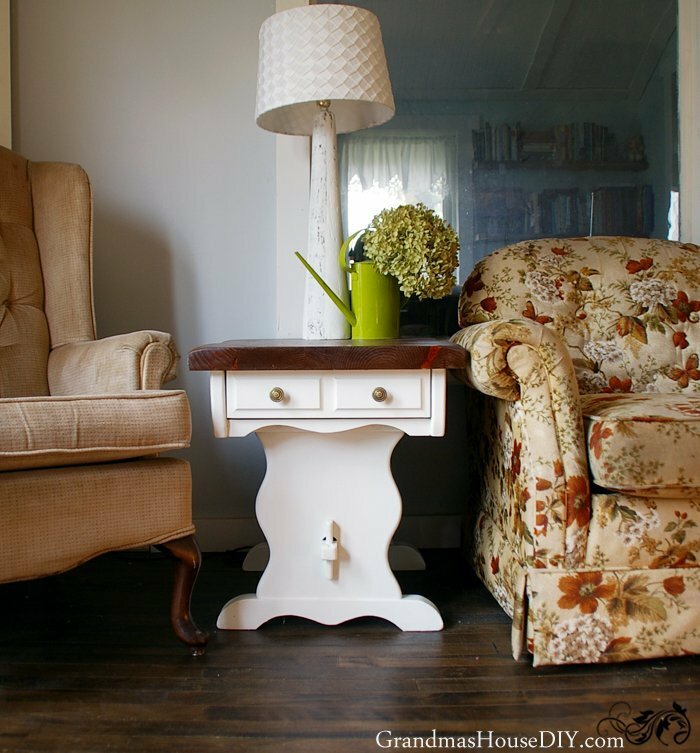 Love the contrast between the beautiful stained top and painted bases. Thank you so much Marie! 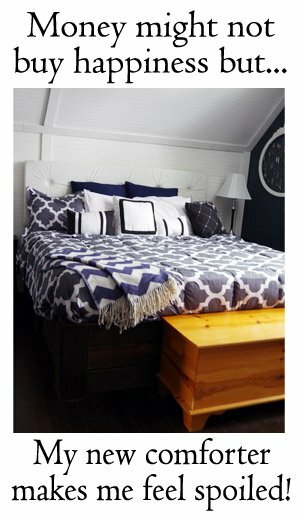 Paint and stain combinations like this one have become my new favorite!! 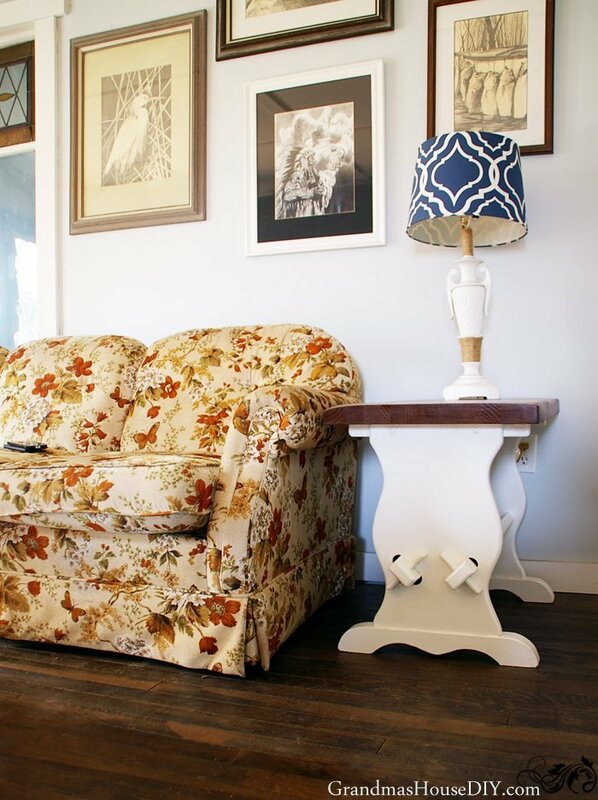 I love stain and paint together in a piece, and this pair looks oh so fab updated Tarah! Thanks so much for sharing them at Fridays Furniture Fix ! Thank you so much Brenda! Its my favorite combination as well! I love how unique the design is. 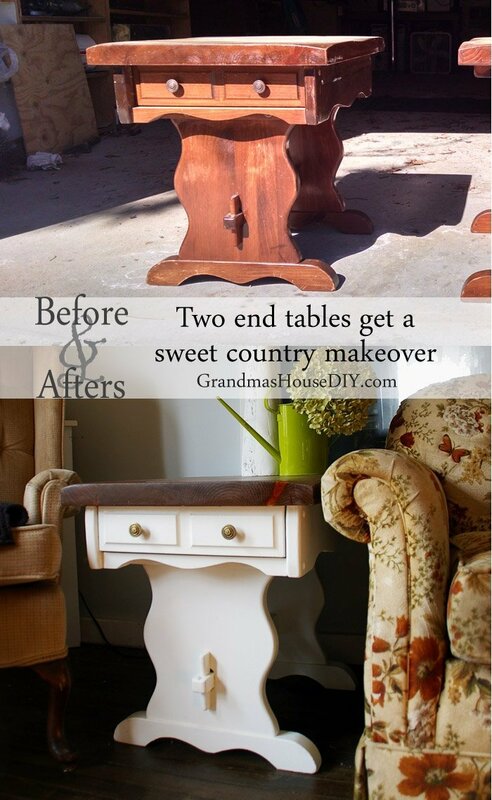 Your makeover made them even better. The white looks beautiful with the dark top! You really scored big-time at the estate sale. 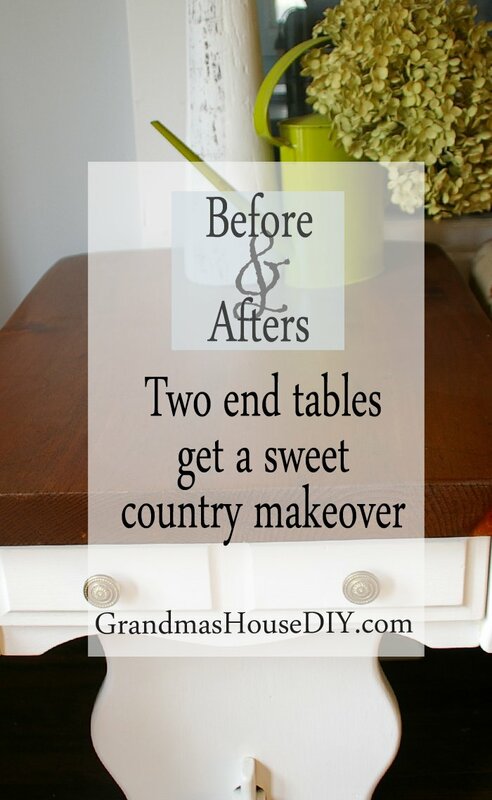 Your furniture flip on the end tables looks great. Nice job! 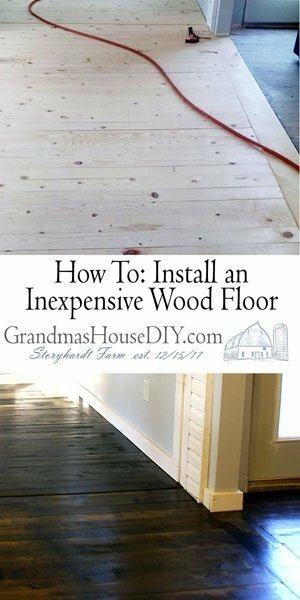 Stopping by from the Homestead Blog Hop.These are absolutely adorable!The wood lover in me has a hard time painting wood too, but I think you might the right call on these. Great work! Thank you so much, have a great week! They turned out beautifully! I love the wood and paint combination! Thank you so much Cherryl! 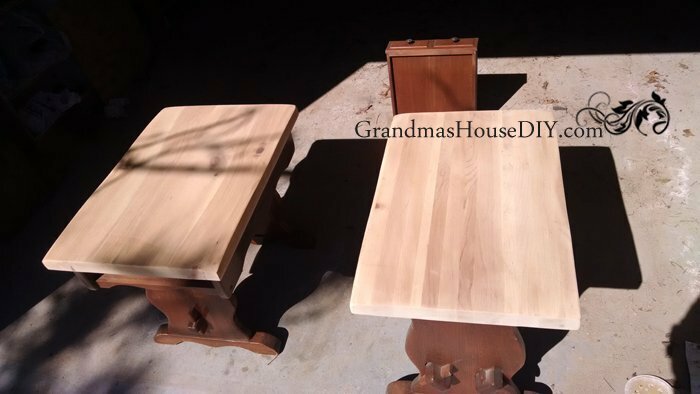 These tables turned out beautifully, and the tops look so pretty. Coming over from Mark & Jane link party!